The Free-Breathing Pulmonex Hose Kit features large bore tubing, which allows for minimal breathing resistance. This inexpensive, high quality, “free breathing” hose kit includes all required components and adapters. The kit contains two 130-901 “Clean-Bore” hoses (36" l x 1 1/8" dia), two 130-904 hose clamps, and a 130-902 non-rebreathing anesthesia valve (inlet and outlet 7/8" O.D. 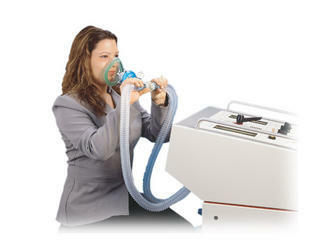 ), which permits the use of standard disposable bacteria filters and masks while providing unrestricted airway.